Catch this exciting offer from PETA. If you have talented kids or simply want them to enjoy summer through acting workshop, here’s you chance to enroll them. 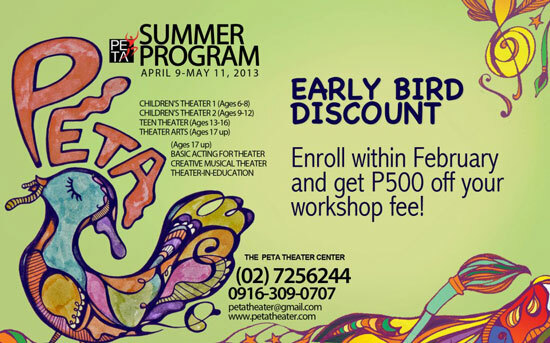 The 2013 PETA Summer Program offers discount for the early enrollees. Visit PETA through Facebook.com/peta.tapets for more information. This entry was posted in Summer/Outdoor Activities and tagged 2013 PETA Summer Program, summer activities for kids, summer workshop, theater, theater workshop, workshop on February 20, 2013 by Yami.